I had the pleasure of stopping by Ryan's Liquor in Port Huron, MI a week ago and was amazed with the selection that this store has. For anyone from Ontario looking to buy American craft beer, look no further. This place is so close to the border that not only could I see the Blue Water Bridge, but I still received reception from Telus on my cell. The owner/manager Brian is very helpful and knowledgeable and through Facebook, he will reserve limited releases on a first come first served basis. 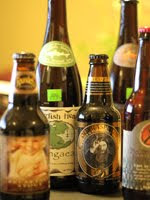 I was able to pick up plenty of Dogfish Head, Founders, Bell's, Goose Island, Southern Tier and many other gems just not available to us here in Ontario. This is a must stop destination for anyone looking to stock up on amazing beer. Ryan's is located at 1837 Pine Grove Avenue, Port Huron, Michigan 48060. Tell them the Beer Geeks sent you!